Using Alexa to Control Your TV! 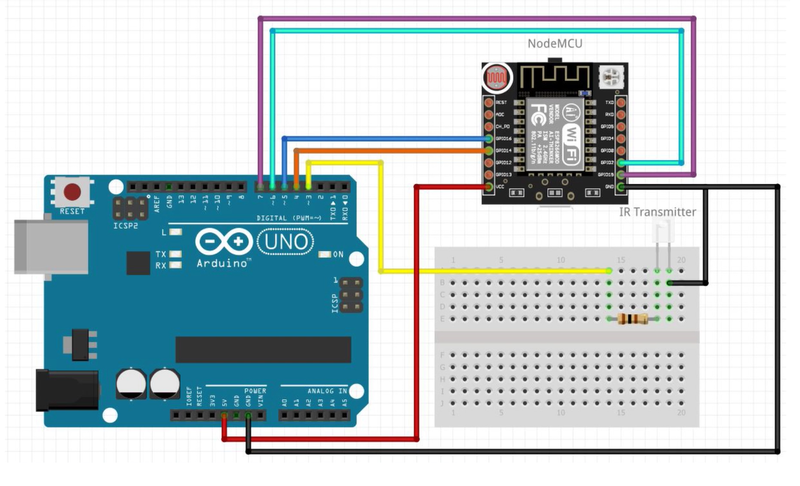 Open up the ESP8266-Alexa.ino sketch and upload it to your NodeMCU (download the board info from Board Manager in Arduino IDE). All you should need to change is the Wi-Fi Credentials and the Device Names. Next, open up IR-Alexa-Send.ino in the Arduino IDE and upload it to your Arduino Uno (make sure you change the uploading board info to UNO). Now go into your Amazon Alexa app on your mobile device or PC, go to your Smart Home and press "Add Devices" to find each of the commands you set in the ESP8266-Alexa.ino sketch. "Alexa, turn on DEVICE NAME"
"Alexa, turn DEVICE NAME on"
"Alexa, turn the DEVICE NAME on"
"Alexa, turn on the DEVICE NAME"
Use this Code on your Arduino to read the Clicker Hits coming from your Remote to the IR Receiver.